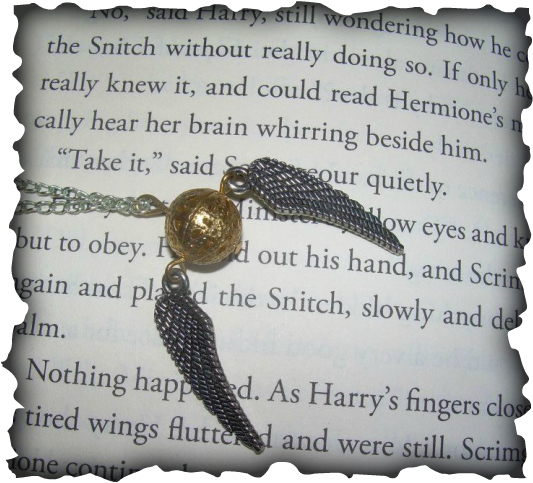 Golden Snitch Necklace, inspired by the Harry Potter series. Fandom jewelry is basically jewelry that has a theme based on a series of books, movies, television shows, or other plot-based media. This can include everything from fiction novels (i.e., Alice in Wonderland, Harry Potter, etc.) to comic books (Spider-Man, the Avengers, various manga, etc.) to science fiction television shows (Star Trek, Doctor Who, etc.). Most fandom jewelry, I either make custom for a specific person or simply for enjoyment on my part. It's probably the most fun type of jewelry, aside from steampunk. So far, my Golden Snitch necklaces are the most popular. I've also made Golden Snitch earrings and an Alice in Wonderland-themed bracelet. I've also been working on a Slytherin (Harry Potter) bracelet. 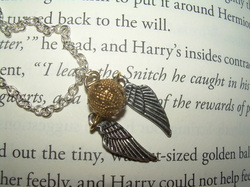 "The Golden Snitch" - Fandom Jewelry - A necklace made to look like the Golden Snitch from the Harry Potter book series. (Harry Potter, Golden Snitch, etc. Copyright J.K. Rowling.) Necklace sells for $15.00. Wing sizes may vary.